India’s Ministry of Finance on 30 July (local time) officially imposed a 25% safeguard duty on solar imports in accordance with the recommendations from the country’s Directorate General of Trade Remedies (DGTR). The declared aim of this move is to protect the domestic production capacity for solar products. However, India’s solar industry compared with counterparts worldwide is still fairly small in scale and produces products that are not competitive internationally with respect to quality and price points. As a result, the safeguard duty is expected to have a negative impact on the Indian solar market during 2H18. Taking this policy into consideration, EnergyTrend also forecasts that India’s total PV demand for the whole 2018 is going to reach just 8.5-9.6GW. According to “Notification No. 01/2018 - Customs (SG)” issued by India’s Ministry of Finance, tariff item 85414011 – “Solar Cells whether or not assembled in modules or panels” – will be subject to a safeguard duty during a two-year period. The imposition of the duty is in line with finding in the investigation report released by DGTR on 16 July 2018. The duty will be in effect starting from 30 July 2018. The table below describes the implementation of this policy as proposed by DGTR. EnergyTrend’s earlier analyses have found that the Indian solar market relies heavily on imports from China, as the following chart shows. The purpose of the two-year safeguard duty is to shelter and foster India’s domestic production capacity for solar products. However, the safeguard duty may not be as effective as anticipated in restricting the flow of Chinese imports. Since the Chinese government released the revised FiT scheme and new regulations for the domestic solar market on 31 May 2018, the entire PV supply chain in China has experienced falling prices and excess capacity that needs to be directed to the overseas markets. As a result, China-made PV modules will remain competitive in the Indian market even after being slapped with a 25% duty. On the other side, India’s solar industry lacks the capacity scale to meet the domestic demand. Indian solar product suppliers also lag behind international competitors in terms of controlling costs, raising conversion efficiency, and meeting quality standards. Hence, the 25% duty will actually increase the cost pressure on EPC providers and solar project developers working in the Indian market, thereby dragging down the domestic demand. India’s grid-connected installation volume increased to 24GW at the end of June 2018. In order to achieve the goal of reaching 100GW in the cumulative grid-connected PV capacity by 2020, India put out around 40GW of utility-scale PV generation for tender from 2017 to the end of June 2018. Out of that tendered capacity, around 11.1GW had been auctioned off. The amount of utility-scale PV generation that India’s Ministry of New and Renewable Energy (MNRE) plans to auction off separately in fiscal year 2018 and 2019 is 30GW. The auctioned capacity will also have to be connected to the grid before the end of 2022 so that the country can reach its 100GW target. Under this context, the implementation of the safeguard duty will contribute to a reduction in India’s PV demand to 2.4-3.5GW for 2H18 and 8.5-9.6GW for the entire 2018. The Indian solar market is expected to remain weak in 1Q19 due to the trade barrier, and the country’s PV demand during the entire fiscal year 2018 will retreat by 30% from fiscal 2017 (note that the Indian government’s fiscal year runs from April to next year’s March). These projections is depicted in the chart below. The Indian government moreover plans to launch policies that will help to expand the production capacity of the domestic PV supply chain – from the wafer to the module sections – by 5GW. Nevertheless, the Indian solar industry is progressing slowly with taking on additional capacity. Since companies in the Indian PV supply chain in the short term will not be able to catch up with foreign competitors with regard to the scale of production, the safeguard duty will only serve to raise the costs of developing PV power plants in India during its two-year period. 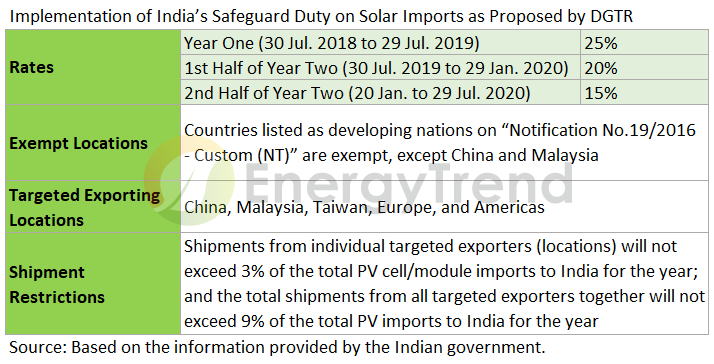 EnergyTrend’s previous analysis on the Indian safeguard duty mentions that the Indian duty, together with the decision by the EU on whether or not to keep its trade barriers, will significantly influence the flows of the international solar trades in the immediate period. The minimum import prices (MIPs) and antidumping/countervailing duties on solar imports maintained by the European Commission are set to expire on 3 September 2018.The table below contains a summary of possible scenarios based on whether or not EU will prolong the imposition of MIPs and related duties. China-made modules will be shipped to Europe freely, intensifying competition and driving down module prices, which may stimulate growth of non-subsidy PV projects. With the shift of shipment of China-made modules to Europe, suppliers in Vietnam and Thailand are expected to fill the vacuum in India. Taiwanese and Malaysian suppliers will face competition from Chinese counterparts in Europe and from third-party suppliers in India. Blocked from the European market, Chinese module suppliers would still face price pressures. European demands will be met by Taiwan and other third-party countries. Third-party suppliers will ship to both India and Europe and pose strong competition to Chinese suppliers in India. In China, the PV demand during 2H18 will be depressed because of the new regulation issued by the government on 31 May. The demand sources that are certain in the Chinese market this year are the 5-6.5GW of additional installations related to the Top Runner Program and 4.186GW of additional installations related to Poverty Alleviation PV Projects. The excess capacity from the Chinese PV supply chain is expected to be directed to all available channels in the overseas markets. Chinese suppliers will not only slash prices further in order to drive sales in India, they will also aggressively expand into overseas markets that have shown demand growth this year, such as Europe, Australia, Mexico, and North Africa. Nevertheless, the global solar market as a whole is forecast to remain sluggish to the end of 1H19 due to the weakening demand in China and India, which are two of the world’s largest regional markets. Solar enterprises will therefore keep undercutting each other and searching for new export channels.